Homer H. Poss Jr., 80, of Highland, Ill., born Jan. 9, 1925, in Lebanon, Ill., died at 11:43 p.m. Tuesday, Jan. 18, 2005, at Highland Health Care Center, Highland, Ill.
Mr. Poss was a retired meat cutter for Kroger Co., for 38 years. He worked in Collinsville, Ill., Belleville, Ill., East St. Louis, Ill., and Highland, Ill. He served two four year terms as mayor of Lead group to sister city of Sursee, Switzerland, New City Hall, Police Station, Fire Station, Power Plant and Water Treatment Plant were erected during his term. He was Interim City Manager. He received a H.B. Kroger Region Award in 1975, Highland Chamber of Commerce Lifetime Achievement Award in 2003, and St. Louis Regional Commerce and Growth Association (RCGA) Lifetime Achievement Award. 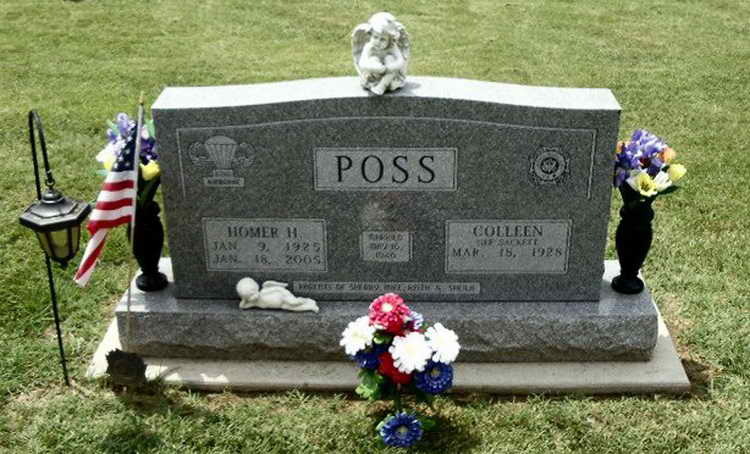 He was preceded in death by his father, Homer H. Poss Sr., who died March 13, 1967; his mother, Laura, nee Ohl, Poss Riggs, who died Nov. 24, 1985; a daughter, Shelly Poss; two brothers, Oliver Gordon Poss, who died at the age of nine, Duane Poss, who died in 1989; and a sister-in-law, Rosalie Poss, who died Dec. 10, 1999. He is survived by his wife, Colleen, nee Sackett, Poss of Highland, Ill., whom he married May 16, 1946, at E & R Church, Highland, Ill.; two daughters and two sons, Sherry L. Fletcher of Highland, Ill., Michael S. Poss of Decatur, Ill., Keith T. (Laurie) Poss of Highland, Ill., and Sheila L. (Lynn) Beil of Highland, Ill.; three grandchildren, Jamie Lynn (fiancee James Patrick) Poss of Columbia, Mo., Jennifer Ann Poss of Maryville, Ill., and Ryan Matthew Poss of Highland, Ill.; a brother, Thomas R. Poss Sr. of Highland, Ill.; a sister-in-law, Myra Poss of Eldon, Mo. ; and numerous nieces, nephews, great-nieces and great-nephews. Memorials may be made to VFW Post 5694, Education Plus Program-Highland Community Schools or to the Family for City of Highland Memorial. Visitation: Friends may call from 3:30 to 8 p.m. Friday, Jan. 21, 2005, at Spengel-Boulanger Funeral Home, Highland, Ill., and from 9 to 10 a.m. Saturday, Jan. 22, 2005, at Evangelical United Church of Christ, Highland, Ill.
Funeral service will be held at 10 a.m. Saturday, Jan. 22, 2005, at Evangelical United Church of Christ, Highland, Ill., with the Rev. David K. Martin officiating. Interment will be in Highland City Cemetery, Highland, Ill. Grave marker for Homer H. Poss in plot 15-65-4, Highland Cemetery, Highland (Madison county), Illinois..
Homer enlisted in the Army at Peoria, IL on 16 February 1943 and was assigned to the 507th PIR. He made combat jumps in Normandy and Germany. Cpl Poss was transferred from the 507th PIR to Hq 2nd, 508th PIR on 18 August 1945. On 26 October 1945 Cpl Poss was transferred to the 505th PIR, probably as a mans to be transported back to the United States.